Have questions about using FileCleaner? Want to know more about Windows cleanup and optimization? Have a look at the frequently asked questions, read the User Manual and check out our articles to become a PC speedup pro! If you can’t find the answer to your question here, please submit a support ticket. We will respond as soon as possible. Dr. Web Antivirus marked your program as Unwanted. Why is that? 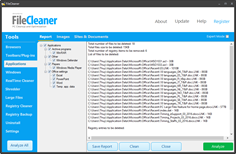 FileCleaner is a powerful and easy-to-use Windows cleanup utility and privacy protection tool. It removes PC history tracks, fixes Windows issues, helps you uninstall annoying toolbars and more. 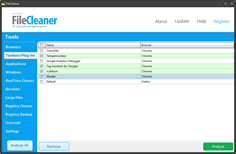 FileCleaner has a very intuitive interface and is very easy to use. Why do I need FileCleaner? Your operating system is made in such a way that it keeps traces and logs of everything you do on your computer. No matter whether you are opening or creating files, listening to music, browsing the Web or chatting via IM, everything gets recorded. This means that anyone who has access to your computer can see which websites you’ve visited, what images and movies you’ve seen, what files you downloaded, and so on. On top of that, all those temporary files take up gigabytes of disk space and make your computer slow. If you want to protect your privacy and make your computer run faster, you need to delete temporary files and history traces. 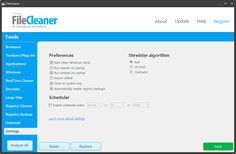 FileCleaner is the tool that allows you to erase all traces of your computer activity, including Internet Explorer, Mozilla Firefox, Google Chrome, Safari for Windows and Opera cache and history. It will also clean system temp files and thus free up disk space occupied by junk files. 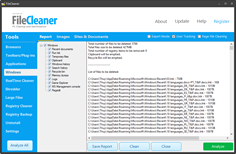 In addition to its history cleanup functionality, FileCleaner has a file shredder that will securely delete files for you, a registry cleaner to help improve the stability of your PC and a large files manager to help you free up even more space. 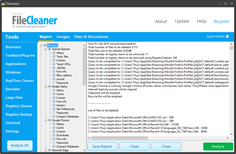 What are the system requirements for using FileCleaner? 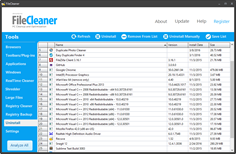 FileCleaner works on all modern versions of Windows including Windows XP / Vista / 7 / 8 / 10. Both 32-bit and 64-bit versions are supported. How do I install FileCleaner? How can I uninstall FileCleaner? Exit the program - select Exit from the program tray menu. What kind of history tracks can be cleaned with FileCleaner? 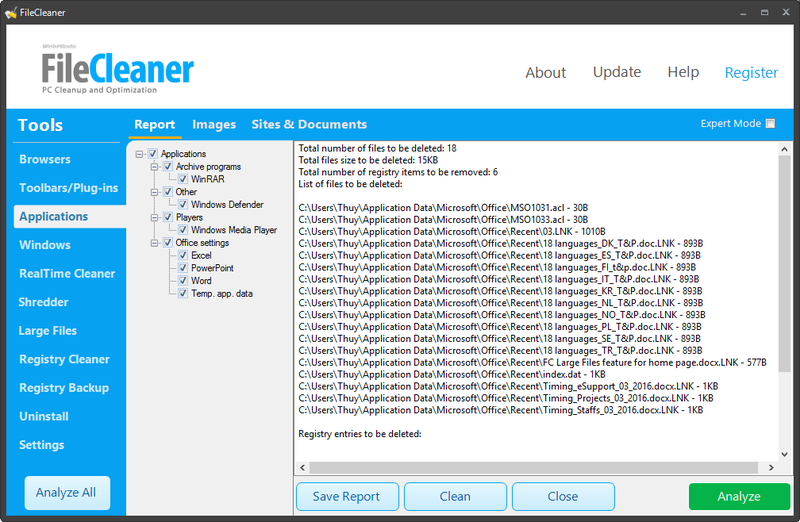 FileCleaner cleans all types of temporary files and history traces. It can clean browser history, browser cache (Temporary Internet Files), and cookies in all popular browsers. In addition to that, FileCleaner erases history tracks and temp files created by third party software and your operating system, clears the Recycle Bin and can help you uninstall browser add-ons and toolbars. The RealTime Protect feature is there to help the user automate disk cleanup and history deletion tasks. It will clean all history tracks automatically as soon as you close your browser or messenger. This will ensure your computer stays fast and malware-free. 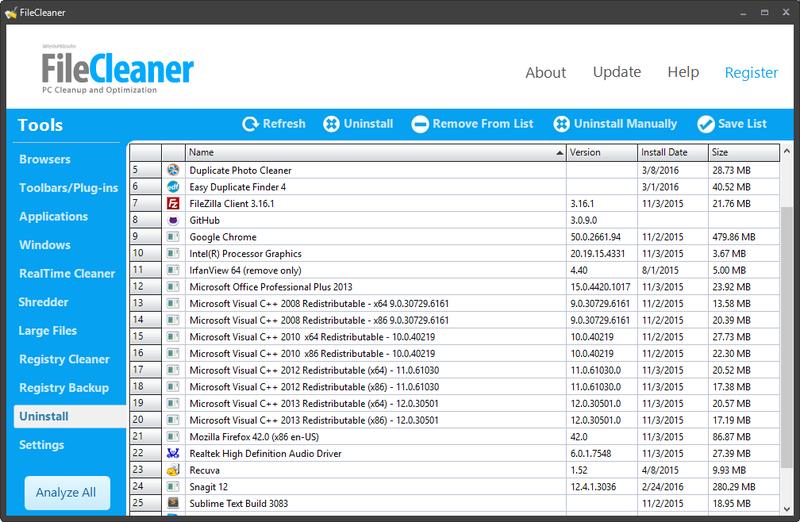 FileCleaner supports Internet Explorer, Mozilla Firefox, Google Chrome, Opera and Safari for Windows. Can I configure FileCleaner to erase history, cache, and other junk files automatically? Yes. With FileCleaner you don't need to remember to manually clean up browser history, delete Temporary Internet Files (browser cache files), clear cookies, empty Windows Temp folders and the Recycle Bin, and so on. All you need to do is schedule FileCleaner to perform automatic cleanup. Moreover, you can enable the Real-Time Cleanup option, which will automatically clear browser and messenger history as soon as you close them. How can I erase history with FileCleaner? 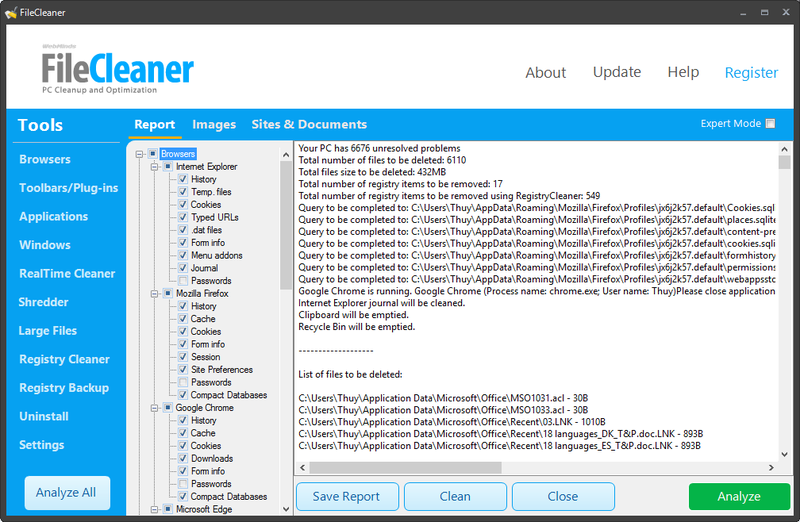 Using FileCleaner to erase history traces is very easy – simply right-click on the FileCleaner tray icon and select “Run Cleaner”. There is also an option to securely erase history traces. 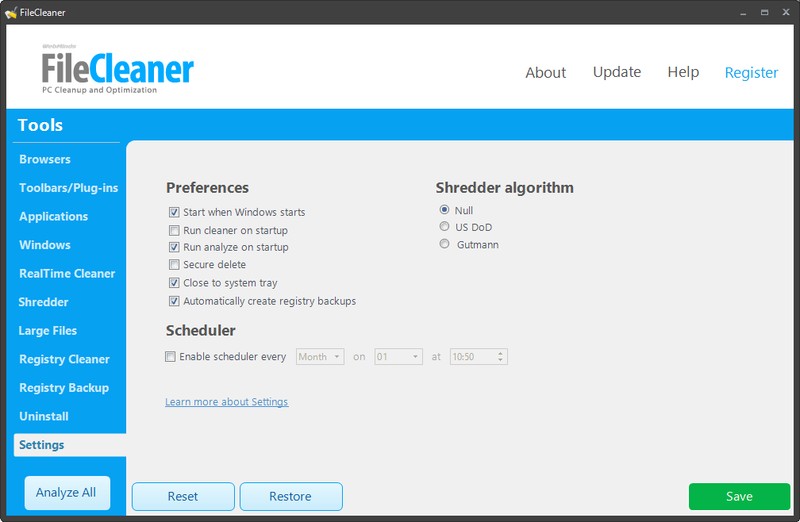 To do that, right-click on the FileCleaner tray icon and select “Run Secure Cleaner”. How can I enable the Real-Time Cleanup feature? Then select the browsers and messengers you want FileCleaner to clean in real time and click on the Apply Changes button to confirm. Can I erase AutoComplete form data with FileCleaner? Yes, you can. While AutoComplete is a very convenient feature, it also poses privacy risks. 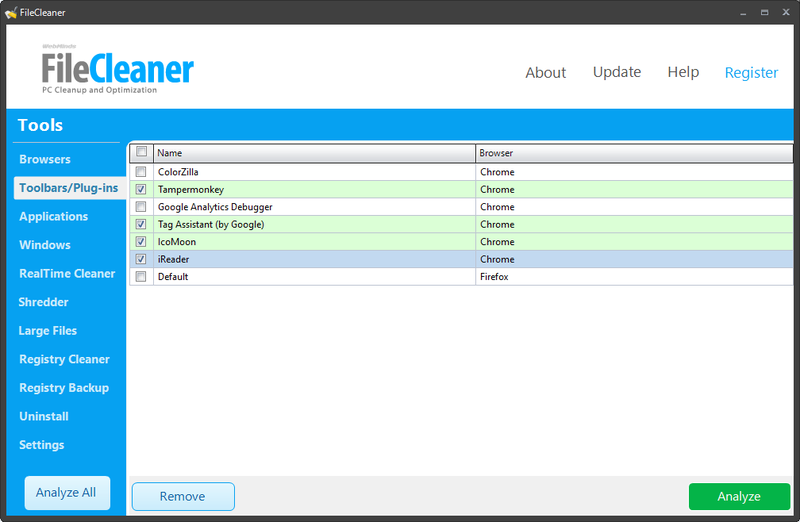 FileCleaner supports AutoComplete data cleanup and help you protect your privacy. Can I delete my stored passwords with FileCleaner? Yes you can. Simply make sure that the option to erase saved passwords is set for your browser and proceed with the cleanup. How do I manually erase Internet Explorer history? The Internet Options dialog window will appear. On the General tab, click "Clear history". Click "OK" to erase history. However, you should be aware that Internet Explorer still stores information about your online sessions in the index.dat file. This file can't be deleted manually because Windows uses it at all times. But when you erase your Internet Explorer history with FileCleaner, the program deletes the index.dat file content and thus protects your privacy. Can I erase Internet history in one click? Yes. Click on the "Clean Now" button or right-click on the FileCleaner tray icon and select "Run Cleaner” to clear all selected items. Index.dat files are cache files used by Internet Explorer. Internet Explorer saves information about web pages you visit, full address of the website/page and the time of your visit in several different index.dat files. Index.dat files can't be deleted manually because they are used by Windows all the time. FileCleaner can delete the content of index.dat files along with history, cache and cookies. Websites store small files called “cookies” on your computer. Cookies are created to help websites recognize users when they return to a website, so that the website can offer customized content to the certain user. This makes using websites more convenient. However, cookies can also be a privacy threat, especially if they are tracking cookies that send information about how you use your computer and which websites you visit to advertisers. That’s why it’s best to delete cookies on a regular basis. FileCleaner can delete cookies in all popular browsers. The program cleans up all types of cookies, including cookie records from index.dat files. How can I erase cookies in Mozilla Firefox manually? How can I erase cookies in Google Chrome manually? How do I prevent FileCleaner from automatically running each time Windows starts? Uncheck "Start when Windows starts"